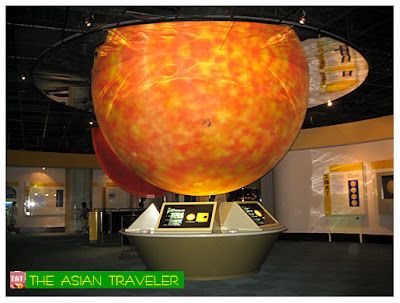 Very close in proximity to National Taiwan Science Education Center is the Taipei Astronomical Museum that covers an area of 1.8 hectares. 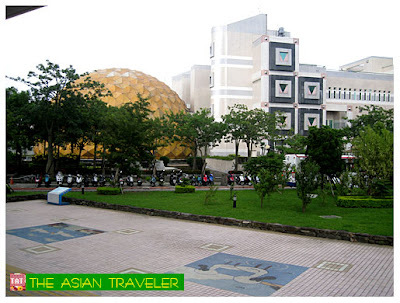 The first thing you'll notice from afar is the museum's golden aluminum dome that houses a planetarium. 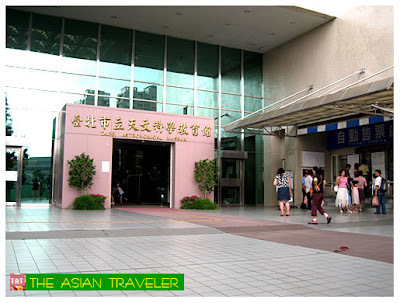 We paid our NT$ 40 (per head, rate as of 2008) entrance fee for Exhibit Halls only at the sales ticket counter located outside the main entrance. The two theaters and the cosmic ride require a separate admission fees. 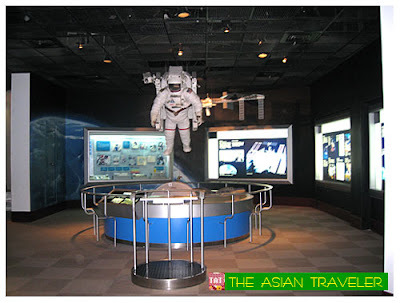 The main features of the museum are the Exhibit Halls, Cosmic Adventure Ride, an IMAX Theater, a 3D Theater (both presenting movies on aerospace and other scientific topics), telescopes and observatories. We proceeded to the Exhibit Halls that covers mainly nine themes. Out first stop was the Ancient Astronomy and the Earth theme depicting the early years of astronomy. 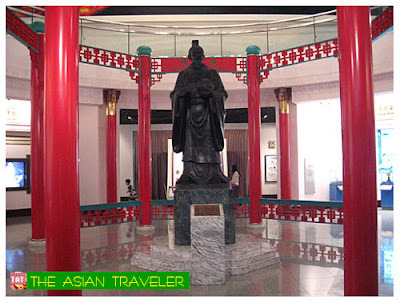 The first thing we saw was a giant statue of one of China's famous astronomers of ancient times, Jiang Heng. Shown also here are many scale models of ancient Chinese and Western astronomical instruments. 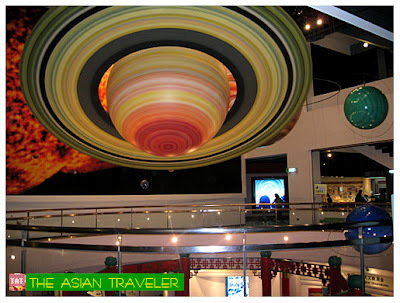 The Space Technology is also on the ground floor, which has a display area with a realistic astronomical world. One of the highlights here is an Astronaut Full Space Suit Replica. There's a cool device that transmit the reflection of your image to the space helmet visor. It looks like you're the one inside the Astronaut's space suit. It was fun! There's another display of life-size Astronaut's suit where you can pop-in your head into the hole of the space suit helmet. Then we wandered to the second floor that concentrates on the Celestial Sphere and Constellation exhibit, the Solar system and Telescope and Observatory area. 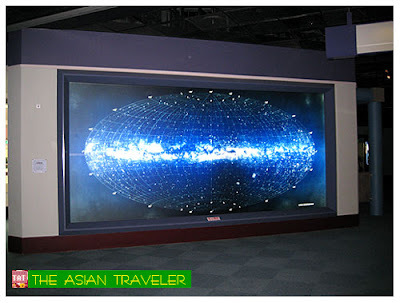 The third floor covers Stars area, the Galaxies, and Cosmology exhibits. The fourth floor is the Cosmic Adventure Facility where visitors will have a ten-minute long educational and amusement adventure ride through the cosmos, a 3-D live environment with special effects and audio / visual equipment. It is said that the seat tilts at 45-degree angle. There's a separate admittance fee of NT$ 70. I felt like I am ready for the ride but hb was still suffering from bad cold and headache, so we never really had the chance to experience the cosmos adventure. We finished our tour of the museum for about an hour, learning the wonders and secrets of astronomy where exhibition galleries feature a variety of displays, scale models and interactive activities. 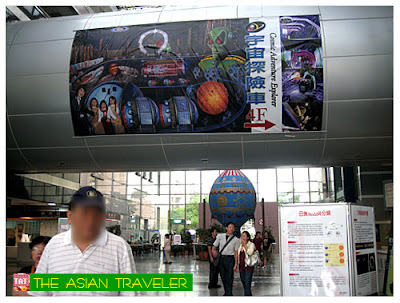 The Taipei Astronomical Museum is located at 363 Jihe Road, Shilin Taipei, Taiwan. It opens weekdays from 9:00 am to 5:00 pm, Saturday up to 8:00 pm. Closed on Monday. 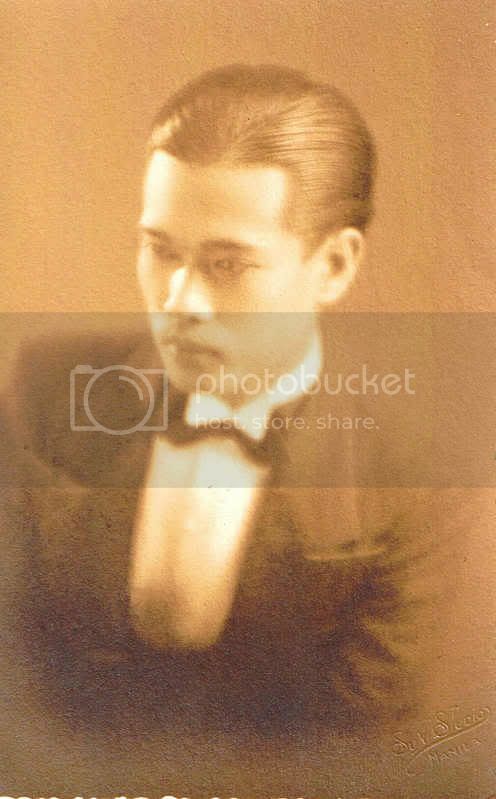 The ictures and narrative are always interesting. I'd love to go there too! beautiful. place is futuristic. i too enjoy visiting places like this sadly there's none here in the philippines. so ill just have to enjoy the current science centers. Nice place!! Similar to the Science Centre in Sg but I think this one is better. Parang gusto ko isuot yung astronaut gear, so cool!